Do not fear, we were able to make it back out to the beach last week. 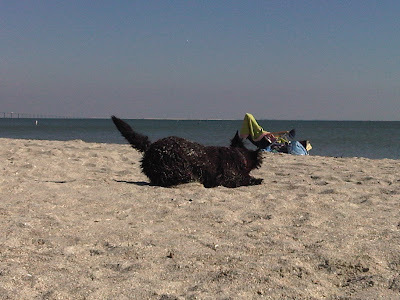 Not just any beach, a dog beach. 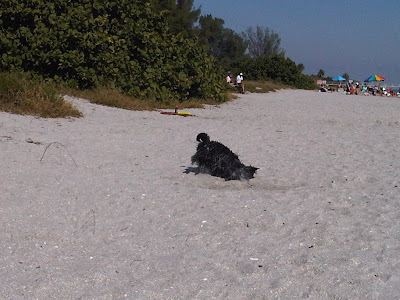 What I know of dog beaches are areas that allow dogs to slash around and get dirty, not a place to hang out. This was not what I expected, everyone sets up camp and hangs out. The dogs just chill and play together, most just lay around in the sand. Pippi swam a few times but mostly rolled around and laid out with us. It was heaven, the other dogs were mellow and just enjoying themselves. Some were funny and there was a cute little guy who swam up and down the beach all day. 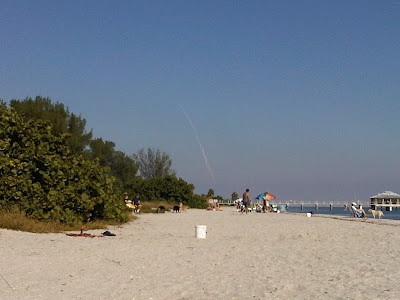 And as an extra special treat, we saw the shuttle launch. That little white line was moving! The whole beach was cheering, very exciting. 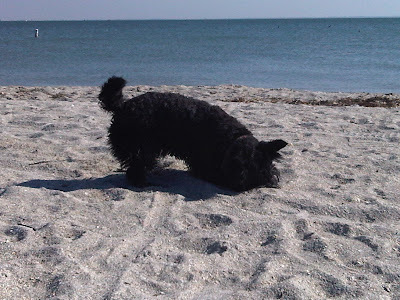 This entry was posted in Amazing Places, cool places, dogs, Outdoor Fun, Pippi. Bookmark the permalink.